My mother bought me this jacket from H&M quite recently and it's only now I've formed a look with it! At first I found it a bit too 'rah rah horsey horsey jolly good show' but I actually quite like it. I'm not sure if it's very 'me' though, but everyone I've asked keeps telling me they love it so I thought I'd just put it out there and get a response from you all! I imagine you and all of lookbook are absolutely sick of my garden... I need to find other places to take photos, but I just couldn't help myself with this one, standing in the vegetable patch just seemed so appropriate! Let me know what you all think? Also, on a completely unrelated note : you know when you comment on a blog and you have to do the 'verification' thing to make sure you're not a robot, so you have to type in "hyufglz" or some random selection of letters? Well... recently I keep getting ones like "STINKY" or "RATTY" ...is it trying to tell me something?! Cheeky bugger. i love this jacket! 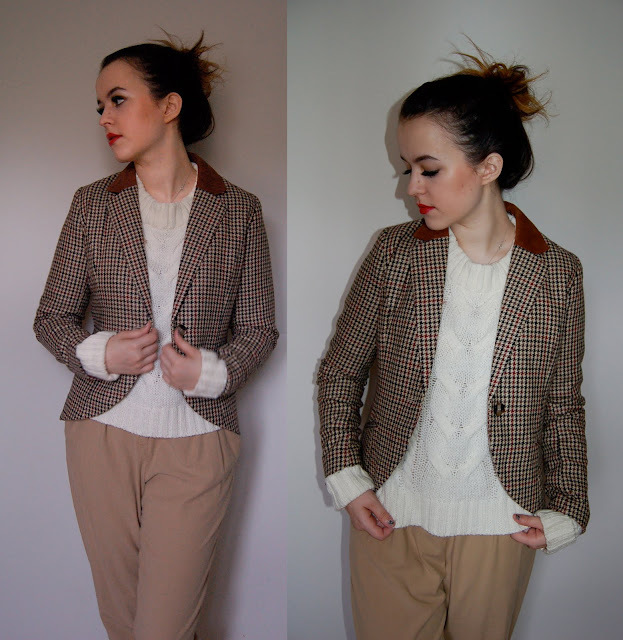 i just recently found a blazer with shoulder pads with a similar pattern to your jacket in my mumma's closet hehe! i'll be stealing that though ha! thanks for the comment, beauty! the outfit is very pretty and i love the blazer. i thought about buying it, too but it doesn't fit me that well. Just found your blog, and I can do nothing but follow it! Great inspiration ! Cute blog, you have killer style! You kind of remind me of Katy Perry and I'm obsessed with her! I'm your newest follower. Thank you for the comment! You have a lovely blog. you look so pretty!and that jacket is so cute! I love the jacket !!! almost bought it myself but i wasn't sure what to wear it with. Now I wish I would have bought it. Really great outfit combo! I can see how it could be a bit horsey etc. but how you have paired it with the other items, you have totally avoided that. The red lip really gives the perfect touch to the outfit :). Girrlll I just love your blog! You look great and I love your make up too! Wow!! The blazer it's cool and you're look so pretty. Thanks 4 stop in my blog. Love the jacket! I have a similar one and also struggled with what to wear it with. I do love your shoes! I think the jacket is fantastic. I love the elbow pad detail. Swing by to enter my $100 Shopbop Giftcard Giveaway! love this! glad I found your blog.